Item# 94507 Size: 33.9 fl. oz. Item# 94508 Size: 128 fl. oz. For equine health and care. Parasitic Insects such as lice, mites, fleas, flies & mosquitoes are a common yet serious problem for horses. These insects feed of of horses causing discomfort and potentially spreading disease. The discomfort caused by these insects can affect the demeanor of your horses making them irritable and more difficult to work with. Also, the diseases these insects can carry may affect the long term health of your horses and reduce their lifespan. 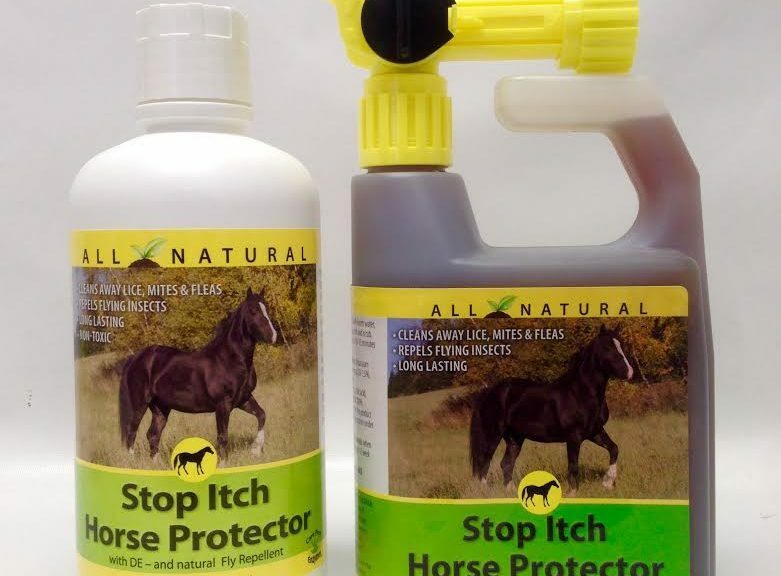 Stop Itch Horse Protector is perfect for keeping parasitic insects off of your horses. 1. Ground Insects: Using a combination of natural enzymes and organic fossilized algae powder, Healthy Stall fights non-flying insects throughout their life-cycle (eggs, larvae, pupa, & mature.) Our formula safely attacks living parasites then creates an environment they cannot easily live in so they do not come back. 2. Flying insects: Healthy Stall also contains organic plant oils which are known to naturally repel flying insects such as horse flies, mosquitoes and gnats, which can carry disease and cause discomfort to horses. Effective & Natural– Healthy Stall is effective against bugs and works to ensure the continued health of your horses. We pride ourselves on making effective products that are safe, natural, & affordable. Carefree Enzymes represents that the product qualified for exemption from registration under the 25(b) FIFRA.